New era: Brisbane Archbishop Mark Coleridge celebrating the Mass for the Brisbane Oratory in Formation on the feast of St Philip Neri at the Church of Mary Immaculate at Annerley, Brisbane, on May 26. 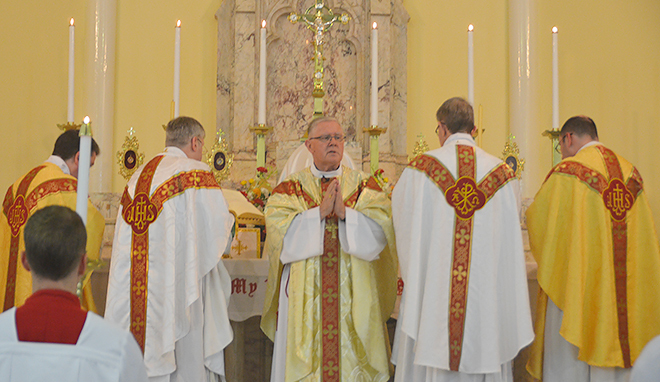 This is a homily ARCHBISHOP MARK COLERIDGE gave at a Solemn Mass for the Brisbane Oratory in Formation on the feast of St Philip Neri at the Church of Mary Immaculate at Annerley, Brisbane, on May 26. LIKE all the saints, Filippo di Neri – or Philip Neri as we know him – doesn’t quite add up. There’s a strangeness about him, a touch of paradox. He didn’t and he doesn’t fit the conventional categories. Nor does God. Philip’s origins were conventional enough for the time. He was born in Florence in 1515 – the year of the triumphal return to his native city of Pope Leo X Medici, son of Lorenzo the Magnificent. First educated by the Dominican friars of San Marco, he was sent at a young age to the south near Monte Cassino where he was to make a future in business and inherit his uncle’s fortune. However, he soon had a religious conversion and made his way to Rome where he would stay for the rest of his life. Philip came to Rome in 1533 when the city was still reeling from the horrors of the Sack of Rome in 1527 and the hammer-blows of Luther’s protests in the north. The Reformation was under way. As a layman – which he was to remain for 17 years – Philip went to the peripheries, to the outsiders. He cared for the sick and the poor, among whom were the many prostitutes of the city. But then he met Ignatius Loyola: what a meeting that must have been! As for many of Philip’s first disciples, this was a turning-point. The Jesuit charism is deep in the DNA of all that has flowed from St Philip Neri. In 1551 he was ordained priest; he was 36. He thought of going as a missionary to India but was persuaded that there was more than enough to do in Rome. So there he stayed. He organised a series of soirées – spiritual, intellectual and cultural – in a hall that was called the Oratory; and there’s a direct link between those meetings and what we do here tonight. Philip and those who gathered around him went all over the city – preaching the word of God and offering the mercy of God in the Sacrament of Penance. That was revolutionary at the time. He was eventually asked by his home-town to take charge of their church in Rome, St John of the Florentines, just across the river from the Vatican. But as his group of disciples grew – some of them from among the most distinguished people in Rome – Philip was offered a small church, which was soon replaced by the magnificent church we now know as Santa Maria in Vallicella, where St Philip lies buried. It was then that the Oratory was formally established. From the first, the Oratory was different, as it still is. Like St Philip, it doesn’t really fit the conventional categories. Where the Jesuits – like most of the congregations founded after the Reformation – were highly centralised, the Oratory was highly decentralised. Like St Philip, its style was homely, simple and everyday; it had a very practical, even popular edge to it. Yet, like St Philip, it had a mysticism simmering just beneath the surface. Like St Philip, it was deeply traditional in the way it looked to the authority of the Successor of Peter, yet it was deeply in touch with contemporary culture. Here is what the well-known English Oratorian Fr Frederick Faber said in his panegyric of St Philip: “Practical commonplaceness was the special mark which distinguishes his form of ascetic piety from the types accredited before his day. He was, for Fr Faber, very much the modern man but drew upon ancient wells of faith and culture. Certainly there was nothing of the mediaeval man about him; and that was the great drama of his time, the clash between mediaeval and modern. In his combination of the down-to-earth and the high mystical, St Philip is like his exact contemporary, St Teresa of Avila. They never met, but what a meeting it would have been! In his sense of the joy of the Gospel and the need to address the reality of today, he is like Pope Francis. I can see St Philip reading Evangelii Gaudium, giving repeated and hearty “hear, hears” to the words of the most recent Successor of Peter. St Paul speaks of joy in the Letter to the Philippians we have read this evening. He wrote these words from prison – a joyless place if ever there was one. But even in prison Paul could rejoice in the Risen Lord. So too with Philip. There was much in the world he knew that was discouraging, even depressing. Yet everyone remarked on his joyful spirit. It was simply irrepressible. From the Gospel of John, we have heard the prayer of Jesus at the Last Supper: “May they all be one”. Philip lived through a time that was riven with divisions of the most virulent kind. Yet he rose above all the divisions as he did above all the discouragements. He showed that more was possible. At this time in the Church and the world, we desperately need to rise above our discouragements and divisions. May those who seek to follow St Philip Neri as the Oratory-in-Formation in Brisbane be men who in our own very different time do what St Philip Neri did in the Rome which he knew and loved so well that he came to be known far and wide as “the Apostle of Rome”. Amen.